Belgian five-piece Amenra have worked their religious-infused brand of Neurosis/Isis/Cult Of Luna-esque ('Cult Of NeurIsis', I've seen used as a shorthand elsewhere...) sludge metal since 2003, over the course of four full-lengths and countless EPs and splits, yet the touches of their sound that I've heard over the years have never really convinced me that they belong in the premier league of the genre. Latest full-length Mass V continues that lack of success, unfortunately, although the band's ability and expertise is clear from the four lengthy slabs of sludge on offer. Three nine-minute songs and a thirteen-minute one ensure that this is a voyage for devoted doombahs, and one with plenty of rewards. The opening strums of Dearborn And Buried have a particularly ominous feel to them, continued with the heavy thuds as the percussion joins them. The previous mention of Neurosis is probably the best touchstone - Amenra sharing a similar grounded, earthier focus than Cult Of Luna or Isis' flights of fancies. 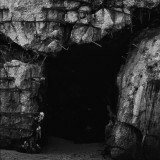 Some elements are eternal, however; shrieking vocals, slow, grinding guitars with an unusual melodic edge, and slow, clanking percussion are the name of the game, and Amenra work wonders here, throwing in some spooky clean murmours towards the centre of the song that make it seem like some arcane religious experience taking place in the cave on the artwork. Just because we've heard it before doesn't mean that it's not compelling when done well, and this is done very well. Soft, scraping ambience opens the following Boden, soon launching into slow, stately doom riffing backed by Van Eeckhout's despairing screeches. Some sinister spoken words seize your attention and make the track time fly by, it almost being a surprise when the song ends and À Mon Âme flows stately in, rather beautiful ambience joined by melodic riffage and building up to a noisier midsection. It soon quietens down again, strummed guitars and whispered vocals showing the band are as capable at the calm as at the storm. Closer Nowena I 9.10 continues this with some clean vocals, before Neurosis star Scott Kelly provides some guest shrieks and vibrant, pulsing riffage draws the track, and album, to a close. Good if not quite great, Amenra prove that they deserve to be on the same label as their influence, but are yet to make a real masterpiece. This is certainly a step closer, however.